POLITICAL TIDBITS: Comelec’s justification for Smartmatic lease contract for 93,977 PCOS, costing P9.6 billion, is it’s “running out of time” for 2016. But IT experts assert that Comelec sat on preparations for 443 days? A clearer diagram on flow of 2013 elections data, as filtered by “Workfile Server” set up by Smartmatic between PPCRV's “Transparency Server” and dominant/minority parties and citizens’ groups. But this “filter” also fed Comelec website, thus putting into serious question results of 2013 elections. 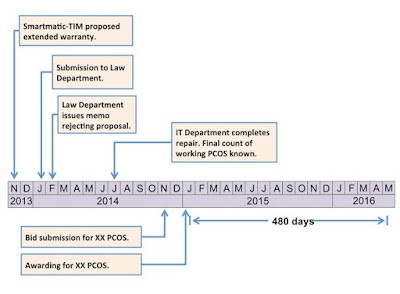 Despite numerous offenses Smartmatic bags 2016 PCOS contract. Comelec’s justification for Smartmatic lease contract for 93,977 PCOS, costing P9.6 billion, is it’s “running out of time” for 2016. But IT experts assert that Comelec sat on preparations for 443 days? A clearer diagram on flow of 2013 elections data, as filtered by “Workfile Server” set up by Smartmatic between PPCRV's “Transparency Server” and dominant/minority parties and citizens’ groups. But this “filter” also fed Comelec website, thus putting into serious question results of 2013 elections. 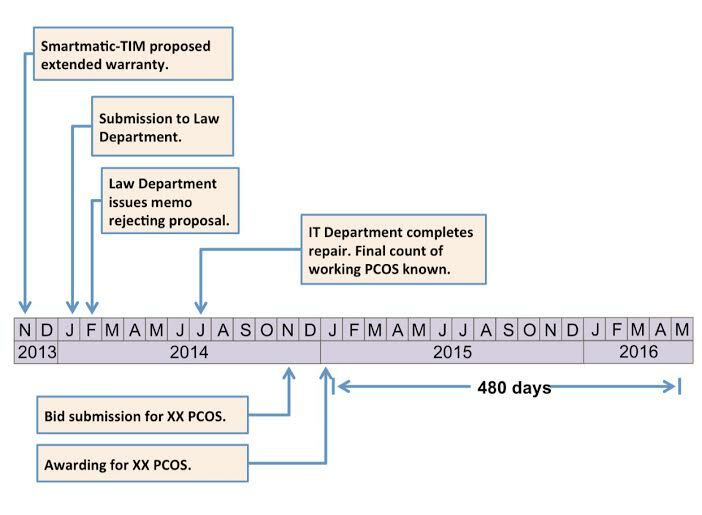 Despite numerous offenses Smartmatic bags 2016 PCOS contract. Defying public opinion and all sense and better judgment, Comelec under new Chair Andres Bautista awarded last Friday Smartmatic-TIM a contract to lease, with option to purchase (OTP), of 93,977 PCOS machines at a total cost of P9.6 billion. In so doing,Comelec consigned to the ignominious dustbin some 82,000 PCOS machines first leased and used in the 2010 elections and subsequently purchased as second-hand units for P1.8 billion in 2013. When those leased PCOS machines were eventually purchased by Comelec in 2013, contract stipulation was that these would be “refurbished” for use again in 2016. Moreover, in the interim, Smartmatic would train Comelec’s IT people to maintain these machines that have been warehoused in Cabuyao, Laguna, since 2010 at a monthly cost to taxpayers of P800,000. Sadly, training was never demanded by Comelec and neither was it offered by Smartmatic---so that with 2016 elections coming up, the poll body felt the need to enter into a negotiated contract with Smartmatic for refurbishment of these machines. Predictably the Supreme Court threw out this negotiated contracted as unconstitutional and demanded open bidding for refurbishment. But predictably too, Smartmatic chose at the last minute not to get into refurbishment, doubtless because it fears that those PCOS units bought with taxpayers’ money in 2013 may not be fixed up anymore. Instead, it offered Comelec the lease of 93,977 new PCOS units in two separate contracts with OTP. Predictably again, despite the collective dread of our IT folks and opposition from various quarters, Comelec last Friday seized Smartmatic's lease offer for those 93,977 PCOS machines at a whopping cost of P9.6 billion. IT experts charge as added woe that this lease deal cost taxpayers P3 BILLION MORE THAN REFURBISHMENT. So it seems like goodbye to the old machines taxpayers paid P1.8 billion for in 2013. Chair Bautista, however, asserts that while those warehoused PCOS machines won’t be used for 2016, they can be refurbished for the 2019 elections. But we all know, as IT Prof. Edmundo Casino of Asia-Pacific College stressed at the Joint Congressional Oversight Committee (JCOC) last week, the PCOS machines---like all machines---are subject to obsolescence. If Smartmatic refuses to refurbish these machines now, would it do so in 2019, when these would sink into worse obsolescence? What rankles with IT folks as well as ordinary citizens is that the poll body didn’t even have the decency to wait for resolution of three petitions filed against this foreign-owned machine provider and Comelec before the Supreme Court---all calling for preliminary injunction or TRO of the PCOS deal, owing to serious legal questions it raises. The first case was filed by eight ranking Catholic prelates led by Nueva Caceres Archbishop Rolando Tria Tirona and other citizens, the second by the IT umbrella group Automated Election System (AES) Watch, and the third by former Comelec Commissioner Gus Lagman, Leo Querubin, president of the Philippine Computer Society and IT professor Maria Corazon M. Akol. As AES Watch spokesperson Dr. Nelson Celis, Ph.D. put it, “Without waiting for the SC action on the legal questions raised against the Comelec and Smartmatic, the poll body proceeded to award the lease of nearly 94,000 expensive new PCOS units to a sham joint venture, in violation of the Constitution and laws as well as COA regulations. Such impunity, lies and blatant treachery to voters, taxpayers and the Filipino people.” Manila Auxiliary Bishop Broderick Pabillo concurred with Celis that Comelec should have waited for the SC decision. Moreover, the JCOC on AES, chaired by Sen. Aquilino Pimentel III, was still scheduled to hold another session at the Senate, where Filipino technology featuring a far simpler, cheaper, more transparent and efficient voting machine (acronym TAPAT) and a corresponding tallying system (PATAS)---projects under the auspices of the Filipino IT for Elections (FIT4E)--- was to be demonstrated sometime this week. Comelec Chair Bautista, whose appointment still awaits confirmation by the Commission on Appointments, justified this lightning contract to lease new PCOS units from Smartmatic by arguing that the poll body is ALREADY RUNNING OUT OF TIME to prepare for the 2016 elections---hence, their option to just lease new units instead of refurbishing old ones. This is the same line Bautista used when the TAPAT voting machine---using the popular tablet and offering voter verification which PCOS seeks to hide---was demonstrated last month at the Pamantasan ng Lungson ng Maynila. Perhaps for next elections TAPAT would be viable, BUT NOT NOW, NO MORE TIME, said Bautista. Various commentators are alleging into this new deal between Smartmatic and Comelec all kinds of motives---from the money angle to manipulating elections for a particular political group. Plainly viewed, as election lawyer Romulo Macalintal pointed out, Smartmatic hostaged Comelec by refusing to refurbish the 2013 PCOS machines and the poll body was only too willing to be hostaged. Sad to say, however, these Comelec actuations are further hurting the credibility of the 2016 elections. IT experts counter that Comelec actually wasted 443 days (one year, two months and eighteen days) before getting its act together on the 2016 elections. To make it clearer for us citizens, PCS president Leo Querubin drew up the diagrams below with his commentary, indicating the flow chart of action---or rather inaction---on the issue of election preparations for 2016. 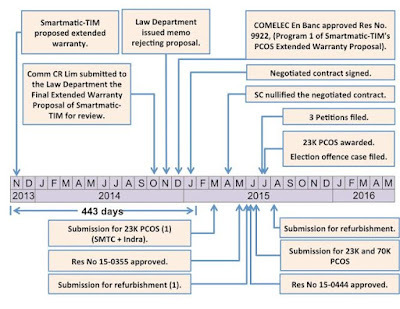 "As you can see, former Chairman Brillantes/Comm CR Lim wasted 443 days from the time the foreign-owned Smartmatic-TIM Corporation submitted its proposal for an extended warranty until the time former Chair Brillantes/Comm CR Lim signed the negotiated refurbishment contract. If Chair Brillantes/Comm CR Lim did not commit grave abuse of discretion (as concluded by all the 15 members of Supreme Court en banc in Pabillo vs COMELEC), then COMELEC would have instead a buffer of 480 days to properly prepare for the May 9, 2016 (National and Local Elections). By using lack of time as an excuse for junking the 80K+ PCOS machines used for 2013 to justify awarding Smartmatic-TIM Corporation the contract to lease 93,977 PCOS , you (new Comelec Chair Bautista), in your watch as the Chair of the COMELEC, have rewarded incompetence, at best or immoral machinations at worst." 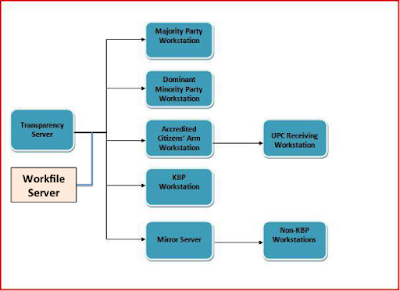 Some readers complained that the diagrams presented in this space last Monday, August 10, about the sudden appearance and true role of the “Workfile Server” in the immediate aftermath of the 2013 elections, seem very complicated to understand. I therefore present below PCS prexy Leo Querubin’s simpler diagrams on the critical role played by this mysterious “Workfile Server.” This server was installed by Smartmatic at the height of the 2013 election transmissions but its existence was unknown, it seems, even to Comelec, until a high-ranking Smartmatic official inadvertently revealed it AFTER the elections, in connection with another issue---the deletion of files in the Transparency Server in the PPCRV premises. What raised the IT experts' eyebrows later was the discovery that this "Workfile Server" served as a "filtering mechanism" for election data on 2013 national and local elections, and was feeding them DIRECTLY TO THE COMELEC WEBSITE. Equally interesting was that this "Workfile Server" was connected only remotely to the Transparency Server at the Pope Pius XII Center in Manila---suspected to be in Makati and connected to the Transparency Server via a PRIVATE NETWORK. Intriguing questions for IT folks: Why this private network and whose was it? Did the Workfile Server decide who was to win and who to lose in the 2013 senatorial race? There were indeed some very curious movements then. Judge for yourself, folks, whether we had honest elections in 2013, and whether we'll have them in 2016.